Wanna see something cool? 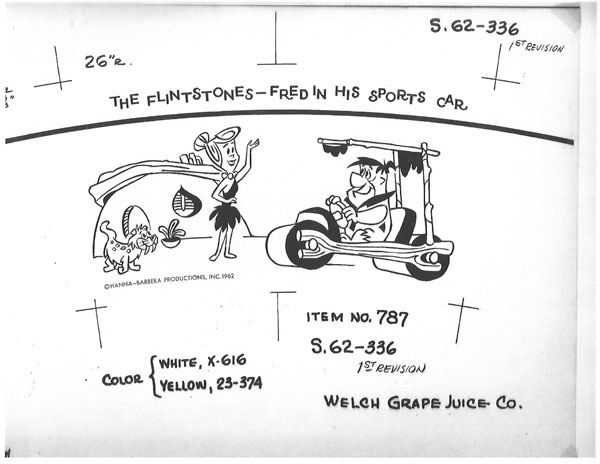 Ned Comstock at the USC Cinema Library found the original art, in their files, for three of The Flintstones Welch’s Grape Jelly jars. I assume you know what these is. 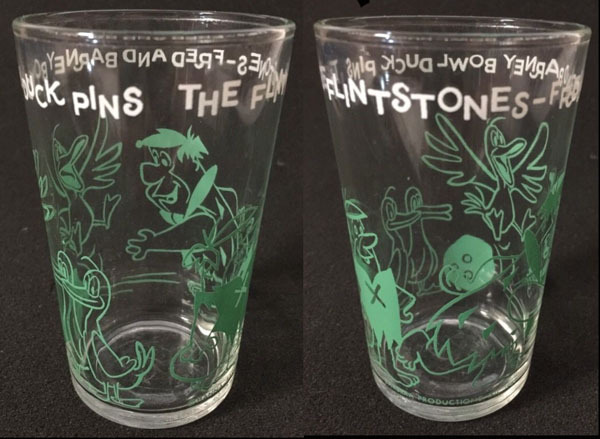 I grew up with these drinking glasses – and still have a dozen of them (some featuring the Flintstones, others with Archie or Warner Bros. characters) in my kitchen cabinet. 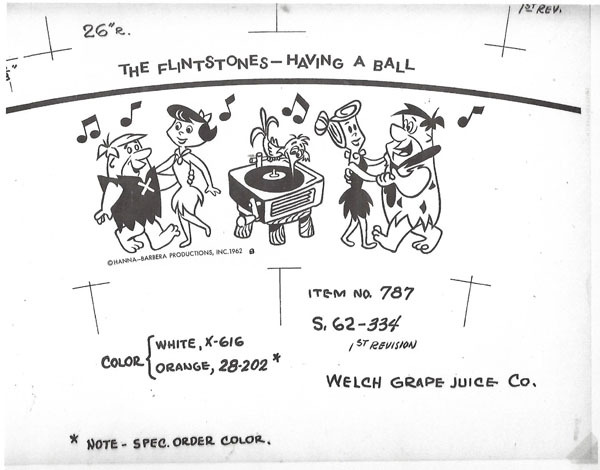 As you may know, in the third ABC prime time season of The Flintstones, Winston Cigarettes pulled their sponsorship of the program, and Welch’s (grape juice and grape jellies) became the primary sponsor. 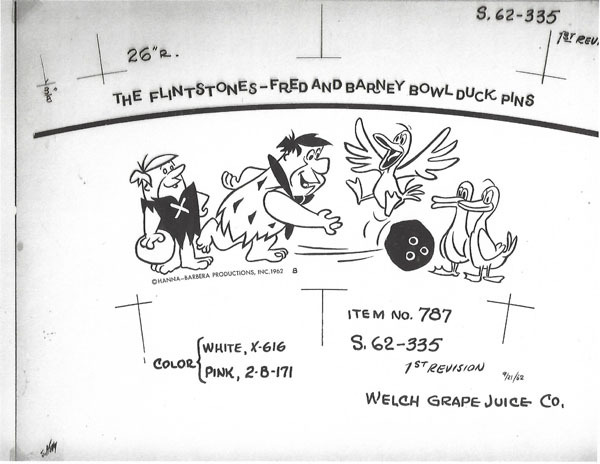 Animated commercials for Welch’s were integrated into the show (see video embeds below) and Welch’s produced a line of grape jelly packaged in jars which were reusable as drinking glasses, with scenes featuring the Flintstones and characters from the show. Let’s take a look at some of the commercial spots – and some of the promotional material that backed up this memorable partnership. With the decision to give Fred and Wilma a baby, the sponsor switch not just from Winston but to a product targeted towards kids like Welch’s made sense (I think there are still some ‘baby talk’ versions of Pebbles asking for grape juice in the later seasons’ episodes, though Bill and Joe kept the baby talk generic there, so they could easily run in syndication with no direct Welch’s mention). And for foreign airings as well. For example, when they finally aired the Flintstones here in the first half of the 1990s, they had a local sponsor (as public TV here is sometimes allowed to use advertising). The sponsor in question is a plastic wares manufacturer. 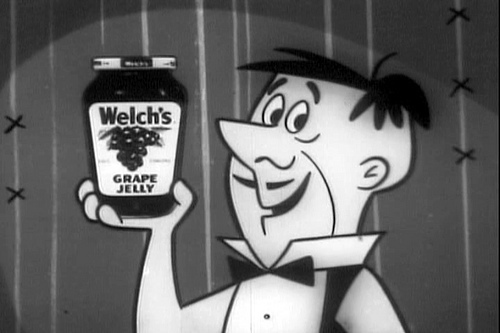 During the original broadcasts, there were commercials for Welch’s Grape Juice, in the days when it was still kosher to allow characters on a given show to appear in commercials during that same show. The one I remember most clearly is where Fred cried because Wilma and Pebbles drank all of the Welch’s Grape Juice and left him only one tiny drop. 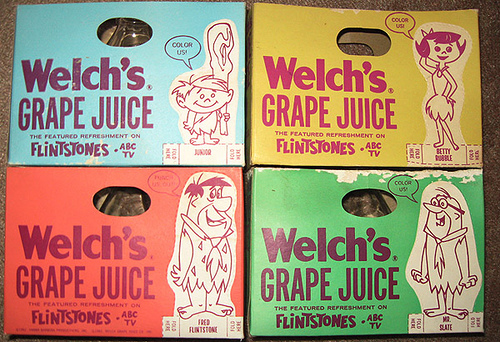 All of the many references to grape juice in the Flintstones were specifically Welch’s in the commercials. It went on for a long time–the commercials and the product placement in the show itself. I was too young to remember the Winston Cigarettes tie-in, but I clearly remember Welch’s Grape Juice. In fact, to this day I associate Welch’s Grape Juice with the Flintstones. I have all of these classic glasses. The look good. They were very small. 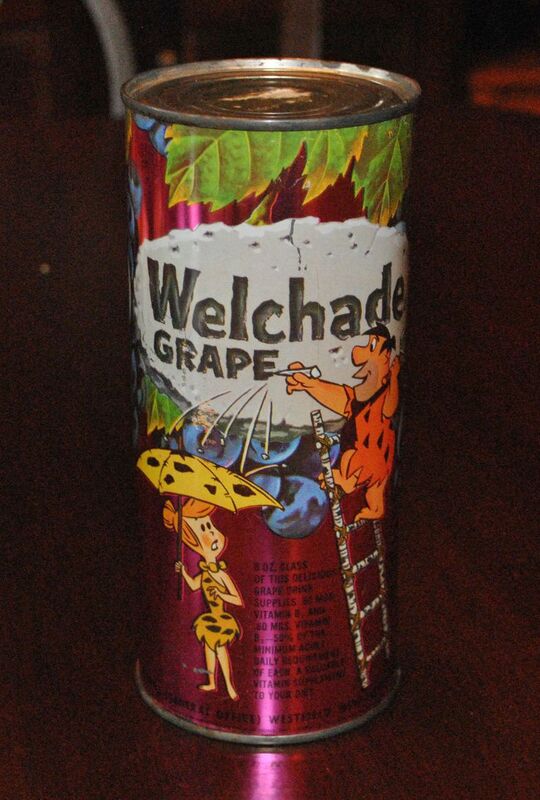 Welch’s, as you know, was the second sponsor to The Flintstones following Winston Cigarettes. I remember a Flintstones episode “Cave Scout Jamboree” where the Flintstones and The Rubbles discover that their favorite campground, “Shangri-La-De-Da”, was now owned by the Cave Scouts International. When the Scouts offered lunch to Betty and Wilma it, of course, included Grape Juice (perhaps Welches?). 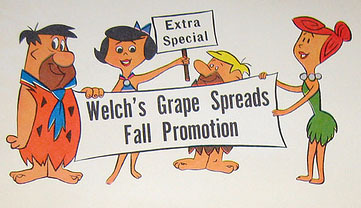 And near the end of the episode Wilma, with Pebbles in her arms, requesting Grape Juice – makes you wonder if Welch’s was behind that Grape Juice plug even thought the sponsors name was never used during the episode itself. Interesting fact: The founders of Welch’s were Methodists who marketed grape juice as an alternative to wine. Thanks Jerry for throwing the post together in a hurry. I grew up with Archies glasses in my grandmother’s cupboard. I’m sure the reason was two-fold: a grandmother being a grandmother and providing something fun for the kids…and also making sure if there were any breakages, they wouldn’t be her own glasses! Hey! On the cardboard packages, is that an early Bam-Bam test-prototype, labeled as “Junior”? He was suppose to be the son of Fred and Wilma Flintstones before they fazed him off in favor of Pebbles Flintstone but Junior later became Arnold the Newsboy in the Flintstones. Yes, I had some of those FLINTSTONES drinking glasses-as-grape jelly jars years ago; such a shame that we don’t have ’em anymore. In fact, I used to drink specifically grape juice in those glasses, because the purple of the juice nicely matched the color scheme of the drawings all around the glass. If I remember correctly, those glasses were somewhat similar to the WILLY WHOPPER drinking glass that was offered when Steve Stanchfield released the WILLY WHOPPER complete cartoons collection, fully restored, to DVD! I also remember the many, many Welch’s commercials (“woo woo gaay-goo”) television commercials. If Warner Brothers was ever interested in fully restoring the entire series (as it has been just about 10 years since the last time we saw those volumes on the format), they should allow us a real peek at animation and TV history by letting the sponsor mentions that creeped into the openings and closings actually appear per season, with actual commercials as bonus features. There were also elaborate sponsors for beer, as I think this site has pointed out before. Terrific idea for a post, Jerry, and consider yourself lucky that you do still have your Welch’s drinking glasses. 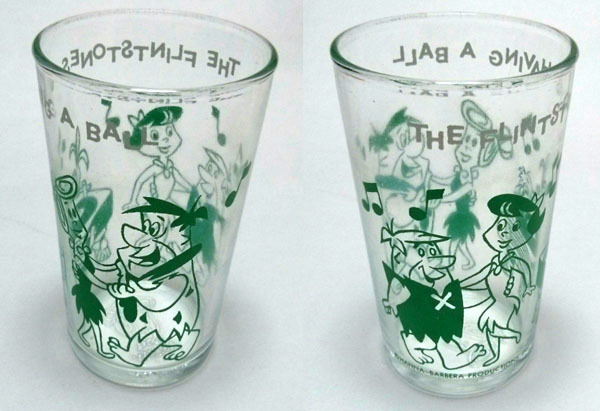 My grandparents also had the small, ~6oz Flintstones glasses. 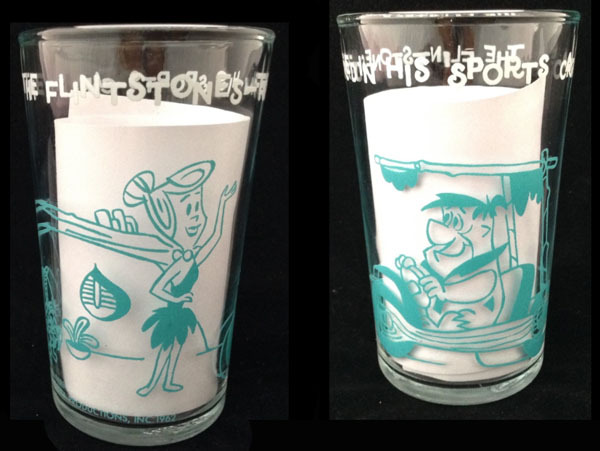 I believe there were also larger, ~10-12oz glasses featuring Jonny Quest characters that came along around 1965. There was also a toy building set with a Flintstones tie-in; for a while the opening title sequence showed Pebbles playing with it. Not being offered a glop-covered slice of bread raises Wilma’s ire, but not the permanent marring of her kitchen walls. Priorities.